And not long after my last post on video games and western culture, we see this awesome follow-up video from NFL Pro player Chris Kluwe, known for his punting skills for the Vikings, echoing and emphasizing many of the same points on gaming culture. Enjoy! Today I had time to play just one game down in the Bunker at Adobe (yes, my workplace is that cool). 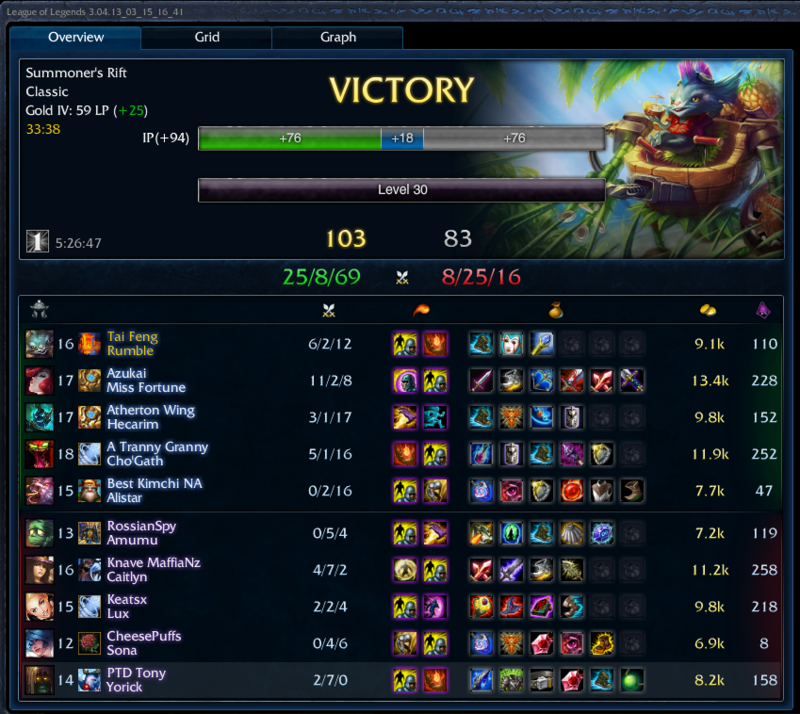 Recently in the AHGL competitive games, I’ve been running Rumble in mid lane as opposed to top like I normally do. He seems like an odd champ for me to pick considering my mechanics for last hitting really suffered when I would only play the support role. Rumble’s kit simply doesn’t jive well with those who have trouble getting minion kills. However, my style as a utility player works extremely well with Rumble’s ultimate ability, that blessed Equalizer. In this match, I went up against a Lux who had the poke and harass to keep me down during the laning phase, but some clutch uses of my ultimate turned around a team fight on my mid-lane tower, scored a blind dragon kill when we had no chance to contest it, and secured a baron kill to drive the rest of the game. Fun times! At the end of Season 3 in the After Hours Gaming League, the second division in the League of Legends B-League was faced with quite the conundrum: a five-way tie in win/loss ratios (4-6 for the curious). Unfortunately, with the playoffs scheduled to take place the very next week, the event organizers and teams did not have the time to play tiebreaker matches since all these folks have full-time day jobs to worry about. So what is a quick way to sort out the few teams that will be able to go on to the playoffs from those that won’t? Co-op vs AI speed runs, of course! I believe in a God that loves us individually and knows us personally despite our lackluster understanding of Him. I believe in an internal locus of control. Even if most of life events are outside of my control, I choose to focus on what I can do better. External factors are not excuses for me to not try or give up. I believe Joseph Smith was a true prophet of God and that anyone can live a better life by following his inspired counsel, regardless of their personal beliefs. I believe in respecting all points of view. I do not think any one person or group has a monopoly on good ideas, and valuable lessons can be learned from even widely different schools of thought.